I recently joined the Society of Children’s Books Writers and Illustrators and my first few meetings have me thinking about my favorite bedtime books. I have a quite a few. 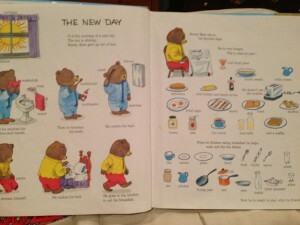 In fact many of my favorite bedtime books have no words! But instead of making a list of which books I love, I am actually going to discuss a style of book that I don’t really care for from the perspective of a parent at bedtime: the list book. I don’t mind these books during middle of the day quiet time, car trips, in waiting rooms, etc. But I do mind their lack of plot, story arc, characters, and most importantly the lack of an ending. At bedtime, I need stories to end. That’s one main reason the Can You See What I See and Where’s Waldo books – while fun!- are not approved bedtime reading, at least with me. Some list books are great. For example, Richard Scarry produces the absolute best and manages to incorporate a gentle, funny storyline that guides readers through his adorably illustrated pages. Here’s an inside spread from The Best Word Book Ever. 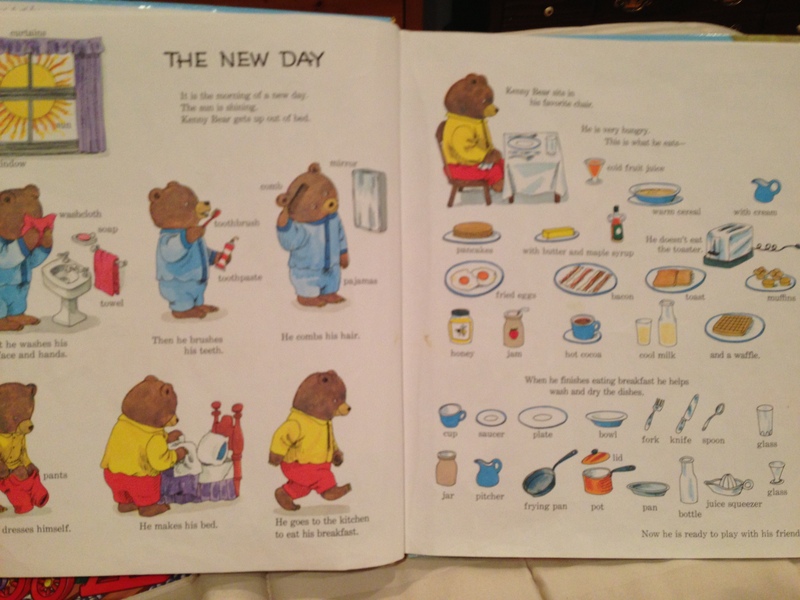 I love breakfast, so I chose this particular page showing Kenny Bear waking up and enjoying a hearty meal to start the day. Delightful! 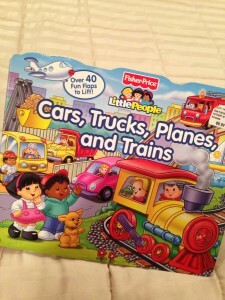 Scarry’s other books, especially Cars and Trucks and Things that Go, do a nice job of combining huge lists of recognizable objects and easy words for children to learn with an entertaining and light-hearted storyline. 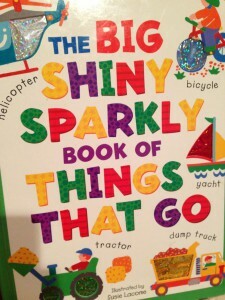 If I were so inclined to write a list book, this would be the style I’d choose. The second book is irritating to me from the perspective of an aspiring writer. Some publishing company out there (more than one, truthfully) churns out these books and sells them to kids and grandparents who can’t resist the sparkle and cashes checks. 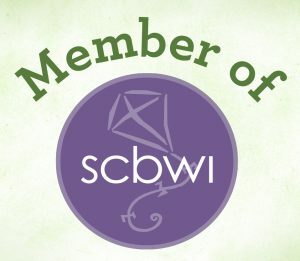 While many writers I know work hard to get their excellent writing recognized. And writers like me wonder if there is any hope for a good storybook in today’s market. 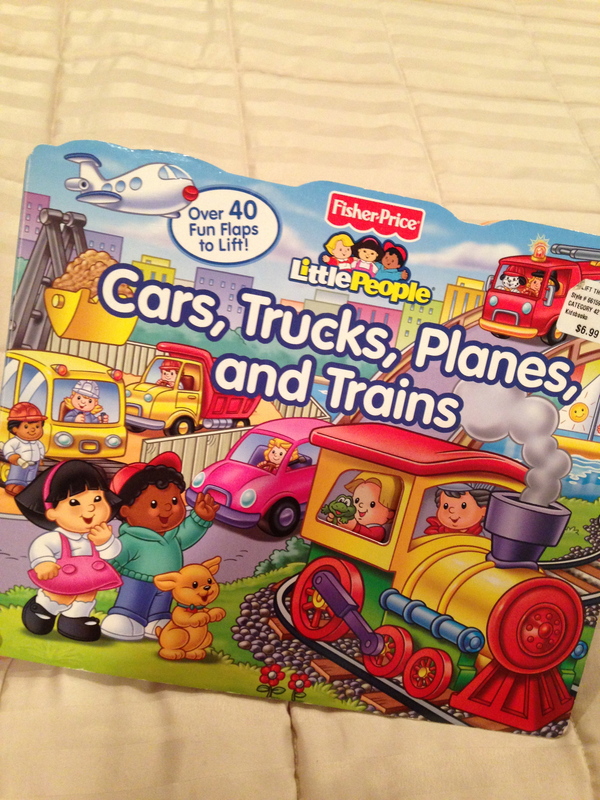 My favorite bedtime books don’t just keep kids busy and they don’t push learning shapes, colors and numbers on kids – but there is a place for those kinds of books. Just not at bedtime. Truly, my favorite bedtime books capture the imagination but also speak to what a child really knows and feels in their world. It’s an art and it’s magic and it sends them off to sleep and dream, while I head off to write and dream! Are there books you absolutely won’t read to your child at bedtime? 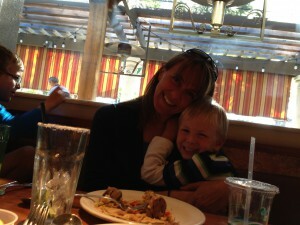 Parents, if there is one piece advice I wish you would follow it’s this: Tricks for picky eaters don’t work. My picky eater recently discovered he likes fresh spinach with ranch dressing. He won’t take it cooked on pizza or mixed in with pasta, but if I set aside a few fresh leaves on his plate and he’ll chomp it down. Another entry in his copy of My Food Notebook! 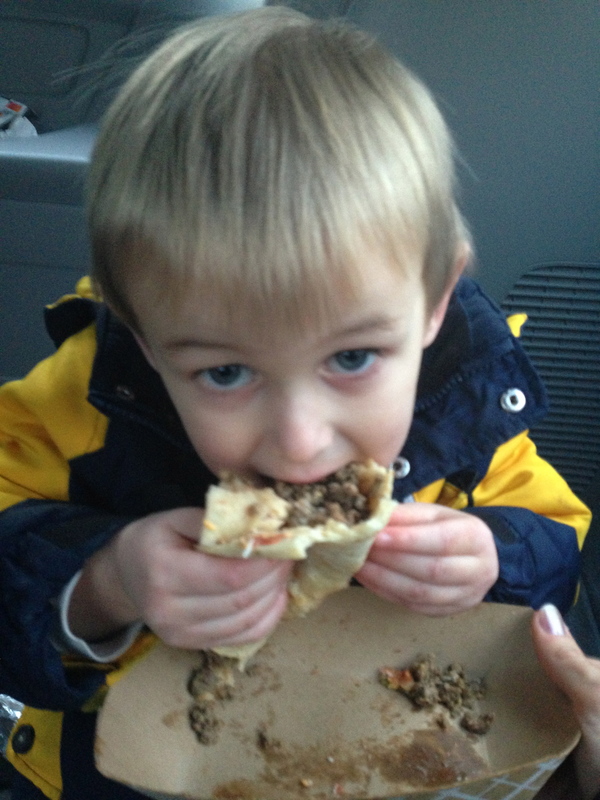 This kid usually avoids salads and fresh vegetables with a passion, so this was a huge victory for healthy eating. But when we ran out of fresh spinach and our CSA sent us Romaine lettuce, we were faced with a dilemma. Do we put the Romaine on his plate and tell him it’s spinach? That’s when I realized: Tricks for picky eaters are not worth it. Setting aside the dishonesty for a moment, just do the math. He already likes spinach. If he likes Romaine, too, that’s 1+1 = 2 new fresh healthy foods to enjoy! He already likes spinach. If we tell him the Romaine is spinach and he decides he doesn’t like it, that’s 1-1 = 0. We’ve just lost a food. Honesty is the best policy. And you know what? He tried the Romaine because it looked like spinach, and he gave it a so-so rating. That’s better than a no! 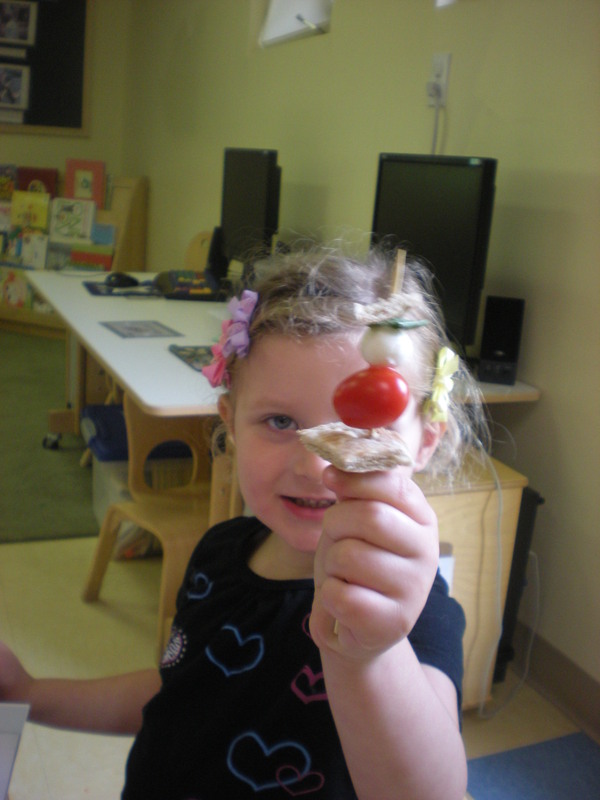 Some parents hide vegetables in recipes in order to get their children to eat healthy, nutritious foods. I’m not throwing stones here, Moms and Dads. I’ve done it. 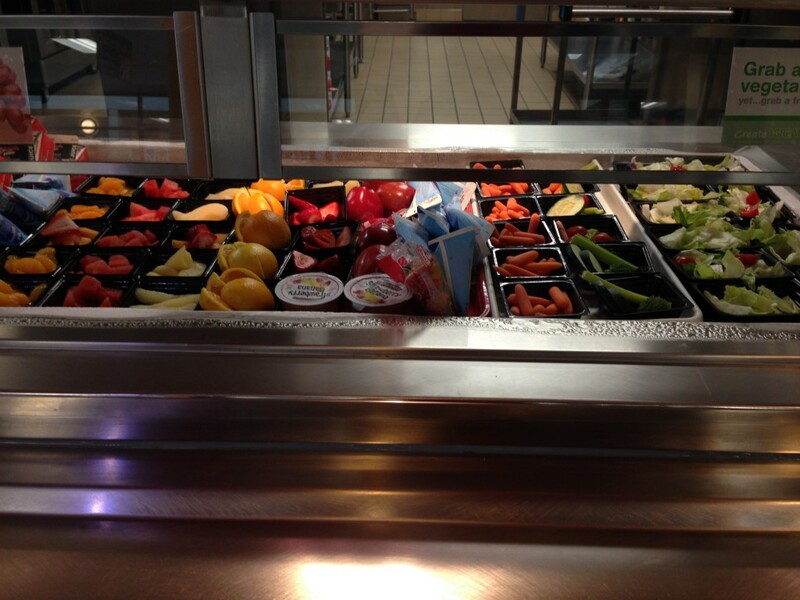 I’m just saying that the payoffs for a kid understanding that they actually like healthy foods are big. Imagine the bliss of seeing your child voluntarily eat fresh fruits and vegetables! Don’t trick your picky eater into eating them, help them find a way to enjoy them. 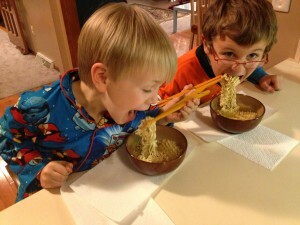 There are plenty of posts about tricks for picky eaters, but I’d rather help my kids learn ways to try new things. I believe it will help them when they are at school, at friend’s homes, at restaurants and more. Prepare the vegetable in a variety of ways. Ask the child to help you select the vegetable. Involve your child in cutting, cooking and serving the vegetable. Celebrate each time they try a new vegetable – don’t punish them for not trying it. Is your child genetically a picky eater? At the Farm to Table Conference in Pittsburgh on March 22 and 23, I talked with a lot of parents about their little picky eaters and how My Food Notebook worked for us. 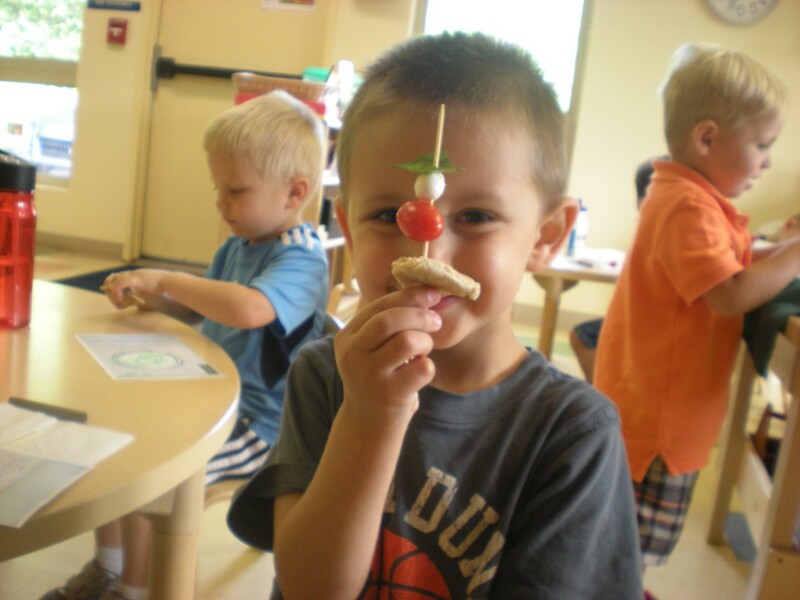 We discussed many strategies that help kids try new foods and a big one that came up often was that parents need to try new foods, too! Recent research from the University of North Carolina, Chapel Hill conducted by Myles Faith, an associate professor of nutrition at UNC’s Gillings School of Global Public Health, reports that genes make some kids more fearful of new foods. I’m willing to bet many parents will read a headline on this research, maybe skim a few lines and say, “Oh well, my kid is genetically picky” and think they are off the hook on getting their child to try new foods and eat healthy. You know what one of the most meaningful ways these food neophobes can learn to try new things? When their parents also try new things. The debate over nature versus nurture is old, and false. Whatever our genes predispose us to be or to do is important but certainly does not decide our fate, because we (and our genes) do not exist in a vacuum. We exist in families and society that offers a large variety of nurturing, some good and some bad. In this case, even if your child’s genes make them more fearful of new foods, their environment, and what they see their parents doing, can help them learn to try. There are lots of other ways to help picky eaters and I’ll be sharing more in coming posts! I love visiting schools and sharing The Bumpy, Grumpy Road with kids. They all understand exactly the challenges that the main character Dylan faces – siblings who borrow their toys, sibling who don’t listen. And they all struggle with how to handle those challenges. I recently spoke with a parent who shared that she wants to give her children good advice on handling the rough patches in life but isn’t sure how to tell them in words they can understand. The Bumpy, Grumpy Road shows kids that life’s challenges are better handled with positive words and calm feelings. My classroom workshops give them a chance to tell their own story of challenges and solutions. Does your child struggle with grumpiness or frustration? Is your child’s classroom looking for a great program to discuss the tough times kids face and how to handle them? I’m happy to visit and share The Bumpy, Grumpy Road and simple activities to encourage positive behavior! Grumpy Kids? Not these Kindergarteners! This post originally appeared in June 2012. 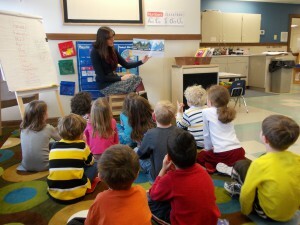 At the end of May, I read The Bumpy, Grumpy Road to two kindergarten classes here in Pittsburgh. At first they laughed with delight when they saw Dylan, a little boy, driving a car. They were impressed! But then Dylan started to use grumpy words. In each of the classes, a child called out, “The sky is getting darker!” They were worried for Dylan. One girl even shook her head when Dylan shouted at his brothers. I continued reading and we got to the page where Dylan sees the first sign. In each of the classes again, a child called out “That stop sign says “Sorry!” They watched with relief and amazement as the sky brightened and the road got smoother with every good choice Dylan made. At the end, they were beaming and laughing again. Those children traveled the bumpy road with Dylan and sped down the smooth one with him when he learned that he can choose his words and attitude. I love the fact that not only did I get to share my book with two wonderful classrooms, but that one class of children decided to make their own books! These thank you notes are actually small booklets complete with author’s names and a few pages inside with words and illustrations! Is there a future writer in this class? Possibly! These thank you notes are the first I received from children, but I hope not the last. Of course the best thank you came from Dylan the night I read him the story, and he cried and said “That’s me, Mommy. Sometimes I am on the bumpy road and don’t know how to get off.” I’ll never forget that moment and hopefully the children who heard this story will remember they, too, can choose which road to drive!